Tickets are still available for the United States Air Force Heritage of America Concert Band performance Monday April 16th, 7:30pm at Brevard College’s Porter Center for the Performing Arts. For six decades, the USAF Heritage of America Concert Band has educated, inspired and entertained over 1.5 million people annually, by providing music for events that support Airmen and their families, honor our Nation’s veterans and build relationships of trust between the American people and their Air Force. The Concert Band is comprised of over 40 professional Airman-musicians who captivate audiences on regular tours throughout the East Coast with a variety of renditions of great orchestral classics, marches, Broadway hits, jazz standards, movie music and patriotic favorites. The program includes Leonard Bernstein’s Overture to Candide, Charles Ives Variations on America, Aaron Copland’s Fanfare for the Common Man, and Percy Graingers’ popular Irish Tune from County Derry. Other favorites include Henry Fillmore’s Circus Bee March, Irving Berlin’s God Bless America, Billy Strayhorn’s Take the ‘A” Train, and the Armed Services Medley. Additional pieces highlighting the virtuosity of the band’s outstanding musicians include solo features for vocalist, xylophone, and tuba. “This is going to be a tremendous concert featuring a wonderful variety of standards and time honored favorites. 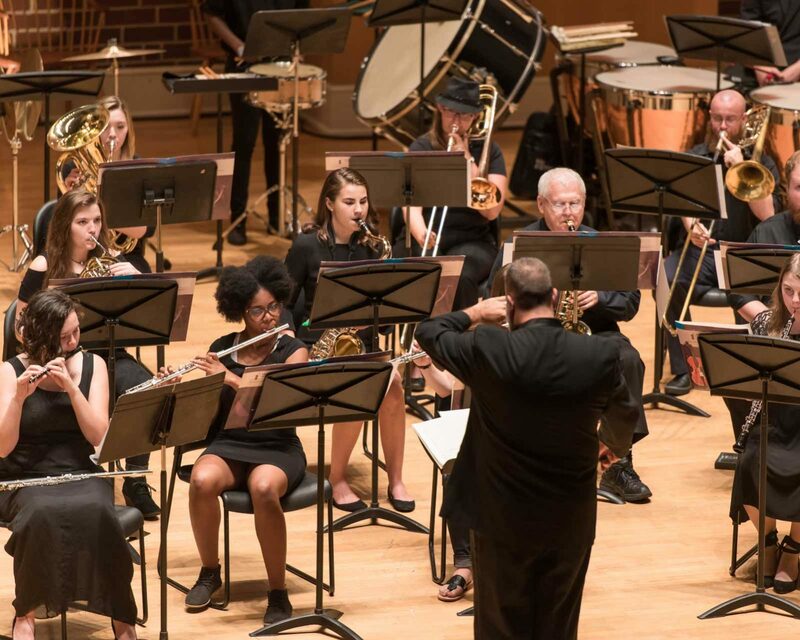 Let’s show our support and admiration for these brave service women and men by filling all 730 seats in the Porter Center’s Scott Concert Hall,” invites Eric Peterson, Brevard College’s Director of Bands and Coordinator of Music Education. The concert is open and free to the public however, those wishing to attend are encouraged to get their tickets in advance to ensure a seat. Tickets are available at Brevard College, Dunham Music Center, Room 104, or the Western North Carolina Military History Museum located at 21 East Main Street in Brevard. If you would like to reserve a seat for will-call pick up the evening of the performance, contact Dr. Eric Peterson at petersea@brevard.edu or call 828-884-8147.